Looks Matter, Perception is Reality, and Go Get Yourself Some Great Headshots, PLEASE! As a speaker, how you look impacts how the world – and your audience – perceives you. For better or for worse, your image needs to attract your target audience, establish your credibility and contribute to, rather than detract from, your branding efforts – so you can ultimately drive more incoming business and charge what you’re worth. Within the first 3 seconds of seeing you, people have probably already made a judgment about you. And these days, with so much business conducted online, prospects, clients and potential partners are likely to “Google” you and see your online presence before they ever meet you in person! Google is the new resume, because even if you do meet someone in person, chances are they will seek you out online to learn more. So…given that your online image is as important as your in-person image, what you need to create is an authentic, compelling and ATTRACTIVE representation of who you are in person that translates well to the digital world. And then you need to take that image and put it everywhere online – even the social media platforms you don’t use – just so that you can OWN your visual image online. It all starts with a photo. Having a great, professional portrait is fundamental, especially if you’re trying to brand yourself as an expert in your field. All speakers and authors have professional portraits, and if you want to be taken seriously, then you need to have one (or many!) too. As a former editor then publisher of a high-fashion magazine, I have produced hundreds of photo shoots, and I can share my personal story about the impact my headshot has had on my speaking career. Everyone always asks me about my “Sharpie picture,” like “what does it mean, Michelle?” Well, quite honestly, the whole thing was kind of an accident. If you know me, then you know I always carry a handful of Sharpies and a blank book to draw mind maps, take notes, and explain things using diagrams and drawings (it’s the ex-math teacher in me…but that’s a whole ‘nother story). I also often use Sharpies and flip-charts in my workshops to keep things spontaneous and fun. So what happened on the day of my headshot photo shoot (with Gio Alma, a photographer I worked with extensively at Ocean Drive Magazine) was, after we’d taken several very serious, professional, traditional “headshot” type pictures (see right) that I was using for my website, I wanted to take some fun pictures just for me. So I grabbed a bunch of Sharpies from my bag and started hamming it up. Gio played along and snapped away. 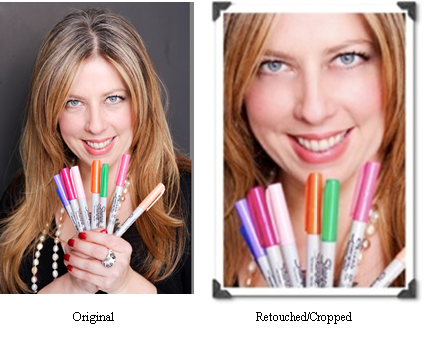 When I got the proofs, I thought the Sharpie pics were silly, obviously not something I would use professionally (haha). I went ahead and chose a regular, “professional” head shot that fit with who I was trying to be (a serious business consultant, of course) and posted it everywhere – LinkedIn, Facebook, Twitter, etc. If you know me, then you also know that I believe the “uh-oh precedes the a-ha,” so I asked the audience, “raise your hand if you agree with her?” Almost every single one raised her hand. I swallowed my pride and went back to the drawing board. There was no way I was going to do a whole new photo shoot, so I pulled out all the proofs that Gio had sent me. I tentatively floated it out on Facebook first…and the response was overwhelmingly positive. Note that a few people HATED (and still HATE) it, but I continue to use it in spite of that. Why? 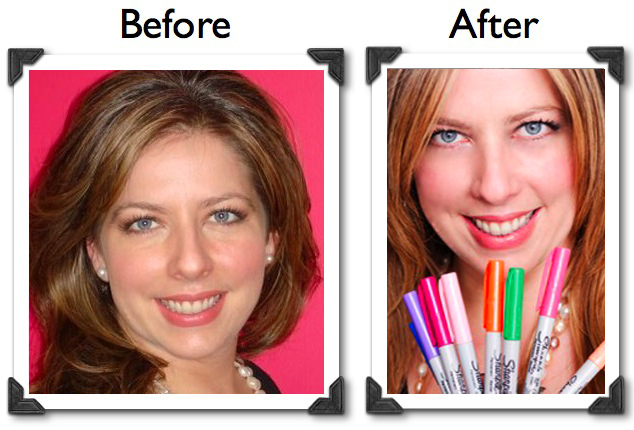 Because it’s memorable, and it’s aligned with who I am – the colors, the smile, the authenticity (I truly love of Sharpies and other office supplies), and it’s memorable – and that’s the purpose of a good headshot for personal branding. In fact, I ended up building my entire brand around the Sharpie pic, and overall, it’s worked. When you Google me, that picture is everywhere, and people remember it. Not only that, it tends to make people smile. Sure there were some people who didn’t “get” it. Guess what? That’s quite all right. Those are not the people for me. The right people are the ones who love it. It’s actually quite a good filter. The takeaway? It’s time to get put some awesome, authentic, beautiful, well-branded pictures of yourself out there! Here are some tips to take a GREAT headshot. Use a current photo. A photo that looks old screams “stuck in the past.” Not only is it unprofessional, but you’re missing the opportunity to keep your brand as current and as relevant as you are. Even if you were more “beautiful” 10 years ago, chances are these last 10 years have given you experience, character and depth. Don’t hide that. Hire a professional. Go hire a photographer to shoot you, and bring 3-5 different outfits. It doesn’t cost as much as you think – you can often find a good photographer for under $100. But be careful – negotiate at the outset for them to give you the entire CD of images. Also, see if they’ll retouch one or two photos for you once you’ve decided what you want to use. Think about color. Use a color scheme that “fits” with your personality and your business, and stay away from small prints and “busy” patterns. Also, most of us should stay away from wearing white, particularly if you are pale. Use props. Having a “prop” may help convey your value and be more memorable. We’ve used everything from signs, to flip charts, to sharpies to champagne bottles, depending on the industry. But also shoot without props as well. Try several poses. Choose the “right one” in the editing process, not the shooting process. Your pose should be right for your brand. No generic, cheesy glamour shots! Your picture should reflect who you are and, if possible, what you do. If you’re a woman, consider avoiding the ever-popular “head tilt.” It’s a “little girl” pose that can diminish credibility, particularly if you’re in a male-dominated field. Make eye contact. While some situations/personal brands require something different, by and large, making eye contact engenders trust. And we all know trust is the basis of every relationship – business or otherwise. Do at least one setup with a white or contrasting color background. Shooting against a white or contrasting color background allows you to create a “silhouetted” photo that can be placed against any color background. That’s GREAT for the web and for getting creative with things like your business card or email signature. Be authentic and show personality! Just because you’re getting a professional headshot, doesn’t mean that the photo has to be generic, stiff or boring. In fact, social media IS about being “social,” so the more attractive and fun your photo – while being professional – the better! Edit when you’re DONE shooting, not DURING the shoot. When you do a photo shoot, be open-minded, try everything. You can always trash the photos later. The creative process and the editing process are opposites, don’t confuse them! One requires open-mindedness, the other critical thinking. Example: During Michelle’s first big photo shoot she pulled out that handful of Sharpies and played around. There were about 100 bad pictures and one magical one, which didn’t become obvious until much later. Post your head shot EVERYWHERE…and tag with your full name. Because of the way Google works, the more places you post your picture (make sure your pics all have your full name as the title (i.e., Michelle Villalobos Mivista.jpg), the more you’ll start to “own” your name. Go back to all those profiles you have online and drop in your headshot. It’s not necessary to use the SAME photo in all profiles, but at least use consistent photos that tell the same “story” across platforms. If you use different photos for different purposes, they all need to be high- quality, attractive and they need to accurately align with the most important brand in the world: yours. At the Superstar Speaker Academy, we’ll be going in depth on how to develop the visual elements of your brand as a speaker, author, coach or consultant so that you attract more inbound business, book more engagements, and stand out among your competitors.